FANNY AND JOHNNIE CRADOCK COOK THE GREAT AMERICAN SONGBOOK opened to sell-out shows and is still touring. Get in touch to book a show – suitable for hotels, restaurants, festivals – and all kinds of venues. Absolute cracker. Best show about food I’ve ever seen, perfect festival fodder. After more than 25 years of bringing theatre to non-theatrical spaces (shops, boats, museums, pubs, Quakers Friars, the Hen & Chicken, the Tobacco Factory), it should come as no surprise that Show of Strength should venture into restaurants with their latest show – an oft hilarious, sometimes poignant portrait of infamous culinary ‘goddess’ Fanny Cradock and her long-suffering husband Johnnie (ask your parents or go to You Tube if you don’t remember their iconic, bonkers TV shows). Not only does your ticket get you this first-rate portrayal of the Cradocks at work in all their pomp, it also includes a suitably Fanny-esque two-course meal as reinterpreted by the host restaurant’s chef: Venue goes to the Square Food Foundation in Knowle and so gets treated to Barny Haughton’s eminently toothsome take on a classic Cradock prawn cocktail and – oh yes – chicken à la Falkland Islands (nowhere near as foul as it sounds). As a format, the evening’s a winner. Rather than being performed cabaret-style while everyone noisily chows down, the theatre comes between courses, with the Cradocks demonstrating – amongst other things – how to make each dish before we get to sample it. Thankfully, the food we eat bears little resemblance to the food we see being prepared by the haplessly flamboyant and fearsomely just-get-on-with-it Fanny or by an even more hapless member of the audience. More importantly, this also means that the theatre has room to breathe, and so while there’s hilarity a-plenty to be had from the monstrous Fanny’s alarming approach to cookery, human interaction and the truth, and from Johnnie’s suave attempts to smooth over the wrinkles, there are also moments – often when the culinary couple burst into tellingly pertinent song – where we get to see how both these desperate bon viveurs have ended up in a bizarre trap of their own making. IN today’s world where most people eat while watching television, texting or playing with a smartphone, there was something deliciously nostalgic about dining in the company of a theatre group. At the home of former Bordeaux Quay chef Barny Haughton, we were treated to a two-course meal of prawn cocktail and “Falklands” chicken, as jazz singer Kate McNab, as Fanny, and The Archers’ John Telfer, as Johnnie, treated us like the audience in a live, musical, cookery show. Those old enough to remember the original Fanny would have found McNab’s treatment of her frighteningly accurate, while the younger members of the audience simply laughed at the French-speaking, overbearing, caricature. Telfer was also excellent as the submissive, monocle-wearing Johnnie. Once dinner was over, things took a darker turn as the Cradocks held a seance and revealed the truth about Fanny’s past. The great thing about reviewing theatre in this city is that you are often surprised, and regularly delighted. So far, so Bristol. Show Of Strength’s new show, Fanny & Johnnie Cradock Cook the Great American Songbook, serves surprises and delights in equal measure. Factor in a slap up seventies meal included in the ticket price, and this Bristol theatre company have cooked up a delicious treat that you won’t want to miss. Most people will be familiar with iconic British cook Fanny Cradock, and her hapless husband Johnnie. What they won’t necessarily know are the ins and outs of her tragic life and loves, and in a charmingly relaxed production that seamlessly blends wonderful music with fantastic performance and non-stop laughs, the audience certainly gets their fair share of Fanny. John Telfer is just perfect as Johnnie, and his musical stylings as he ushers us around the world of a culinary legend are worth the price of admission alone. He has a delightful voice, and shows a deft touch at the keyboards. But he is almost intentionally muscled out of the spotlight by Kate McNab as Fanny Cradock, who rules the room as she must have ruled their relationship with a tour de force personality and voice. Putting it simply, she is Fanny, and it was all I could do to stop myself asking her for cookery tips when the show was over. Writer/producer Sheila Hannon has created a real experience with this show, and her cast and crew effortlessly transformed the Create Centre cafe into an intimate dinner and jazz venue. You are drawn into Fanny and Johnnie’s world from the moments the lights dim, and it’s genuinely surprising to find yourself back in 2012 as the show closes. The performance is wrapped around a lovely two course meal, and you will find yourself enjoying the good company of your fellow diners as well as the terrific theatre on offer. 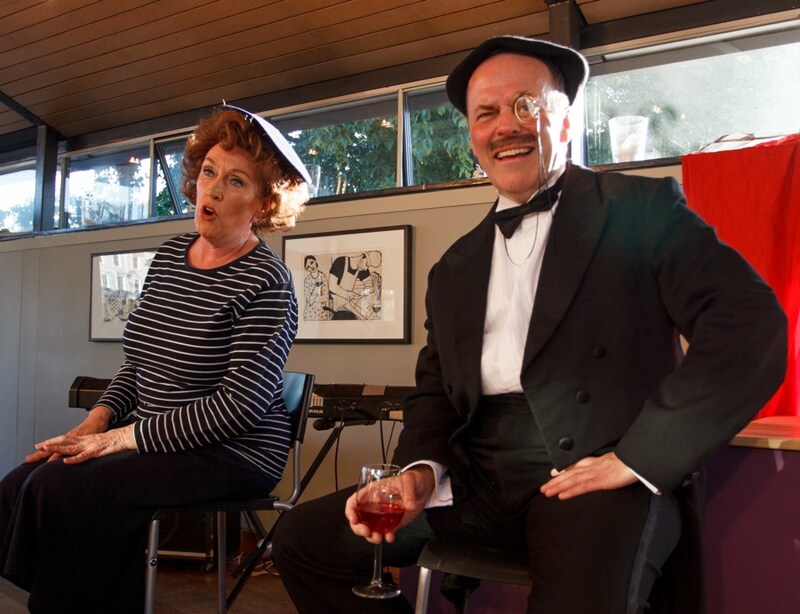 Fanny & Johnnie Cradock Cook the Great American Songbook is touring a selection of Bristol venues including Square Food Foundation, Riverstation, Arnos Manor Hotel, Folk House Cafe, The Square and Hen & Chicken. Tickets will go very fast indeed (and some venues are already sold out), so get your skates on theatrical foodies, it looks like dinner theatre is back on the menu at last. The evening starts with Fanny demonstrating her world famous and classic prawn cocktail with some help from the audience (this is not a show for the shy). Although Fanny insisted on insulting the good people of Somerset, this Somerset lad could not hold it against her. Even the insults were delivered with breathless charm. After act 1 is done, the audience is served the Arnos Manor’s take on Fanny’s prawn cocktail… at the perfect temperature with lovely presentation… I love food that brings back childhood memories and this was no exception. Act 2 involves more insults, this time directed at certain chefs including some well crafted lambasting of the creator of Coronation Chicken…the highlight of the evening: a beautiful rendition of “I Got You Under my Skin”! I was not the only one with tears of laughter streaming down their face. Fanny and Johnnie return to conduct a seance in the hope of contacting her culinary hero and spirit guide. Sadly they slightly miss their intended spiritual target and end up with some startling revelations about Fanny’s past…providing yet more hilarity along with further audience participation and stunning piano playing from Johnnie. Kate McNab and John Telfer inhabit the characters with class and John’s jazz piano along with beautiful singing from Kate were highlights of the evening. If you’ve not caught them yet I urge you to hunt out a performance: you will not regret it. Note: tickets and meal were free of charge, but in no way impacted on our opinion. We were not obliged to write a positive review, and venue and theatre company didn’t see this review before it appeared on the site.